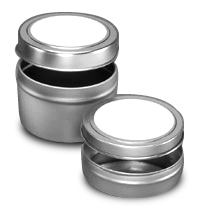 Slip cover tins are great for samples to packaging specialty items such as tea, balms, candles, or lab use. The deep style seamless tins have rolled edges. These labeled tins provide a write-on area. All cans are tin plated steel. 20-1 1 oz. Deep Style Tin 1.53" x 1.03"
20-2 2 oz. Deep Style Tin 1.94" x 1.19"
20-4 4 oz. Deep Style Tin 2.41" x 1.5"